In The Global Economics Game each player is in charge of a country's economy. They are the chief economic advisers to the president, the congress, and the central bank of their countries. The object of the game is to be the best at selecting economic policies to maintain full employment, low inflation, and economic growth without excessive pollution. The Figure above shows the playing field of The Global Economics Game. The best place for a country to be is at full employment in the center square with the number 15. The United States, United Kingdom, Japan, and the Euro area countries are not in the center square, they have unacceptable unemployment, and they are heading toward a depression in the lower left hand corner of the playing field. The Economic Indicator points in that direction in 2008. The Figure also shows that the most direct counter-cyclical policy tools to get out of or to avoid a recession are: 1. Increase the Money Supply and, thereby, lower interest rates to indirectly stimulate consumer and business investment. 2. Increase Government Spending for public goods and services like infrastructure that will directly create new jobs. 3. Depreciate the Currency, which stimulates exports and curtails imports. [For a more complete discussion of the global economy in 2008-09 see this article: Another Great Depression? - Why the Obama Stimulus Package Is Necessary]. [Note: As an economy moves from left to right on the playing field it grows faster. As it moves up it gets more inflation; as it moves down it gets disinflation and deflation. Black numbers in the playing field indicate a positive score. Red numbers indicate a negative score. The further into a corner an economy goes, the worse its macroeconomic performance and the lower its score. The best score is in the very center where there is full employment and other macroeconomic goals are in balance]. In the lower left corner, your economy is in a depression. Total spending for goods and services has declined. Production and incomes are falling, and unemployment is rising. The deeper into the corner you go, the worse it gets. In the upper left corner, your economy is in stagflation. That's a recession combined with inflation and unemployment. This can be caused by natural disasters, rising resource costs, excessive regulation, or contrived shortages through production controls. In the upper right corner, inflation is out of control. Hyperinflation is caused by too much spending and too much money. Skyrocketing prices are eroding the purchasing power of money, savings, and household income. Down in the lower right area, you economy has ventured into cybernation. The dynamics of rapid technological and global changes are structurally displacing workers, causing greater income inequality, and generating unintended consequences of excessive pollution and other harmful environmental effects. The object of the game is to stay out of the corners and accumulate the most points by landing in or near the center of the playing area as frequently as possible. At the beginning of each turn, your country will move in the direction of the Economic Indicator. It represents the total market forces of aggregate supply and aggregate demand. These forces reflect the decisions of a multitude of households, businesses, and governments to spend and produce. Together, the forces of aggregate supply and aggregate demand combine to determine the direction of overall economic activity. Essentially, the Economic Indicator is a barometer and forecast of where the global economy is heading. Sometimes the Economic Indicator unpredictably changes direction, just like in the real world. Economists refer to these changes as business cycles. They are recurrent, but non-periodic. That is, overall economic activity changes direction in unpredictable frequencies and patterns. During each player's turn, a specific Current Event will occur. Stock prices may decline or there may be a bumper grain harvest. These events are selected randomly by the computer. They are independent of the Economic Indicator and may either reinforce or offset the general trend. Fiscal policy refers to government spending and taxation. One of the major features of fiscal policy is that budget matters are subject to the political process. Politicians may disagree about what government programs are the most important and how best to raise revenue to finance spending. Sometimes there can a significant time lag before the government can actually get spending and tax programs into motion. To reflect the political character of fiscal policy, your available options are limited. For example, if your country is in a depression, the appropriate policy would be to increase government spending. However, you cannot implement an increase in government spending unless you have the option. The timing and effectiveness of fiscal policy may be diminished by policy gridlock. Trade policy manipulates exports, imports, and foreign investment flows. These policies are very important to the game, because they directly affect other countries. When you select a trade policy, your economy will move in one direction and another country's economy will be moved in the opposite direction. However, players are allowed to form free trade agreements to avoid the negative effects of protective trade policies. Monetary policy is control of your economy's money supply, interest rates, and banking regulations. Unlike fiscal and trade policies, monetary policy is not generally subject to political constraints. An independent central bank can implement policy quickly. However, many economists estimate that there is a time lag before a given monetary policy begins to affect output, employment, and prices. To reflect this, your monetary policy will not take effect until your next turn. Managing your country's economy will involve delicately balancing economic goals and policies in a volatile global context. The combined forces of aggregate supply and aggregate demand are powerful and dynamic. Effective economic policy responds as quickly as possible to the economic circumstances and changes as they occur. Every game you play will be different and a new experience. You can play against other players or match wits against the computer. Win or lose, you will enjoy playing The Global Economics Game. Place an Order: The price of 1 CD is $20.00 plus $5.00 for processing, packaging, and mailing. Volume discounts and annual site licenses for large institutions are available. THE GAME IS ALSO AVAILABLE IN DOWNLOAD VERSION WITH NO S&H FEE. You can place a direct order through PAYPAL or a credit card or make a printed copy of our order form and mail it to the address at the bottom of the form. Click here to place an order: order form. Questions and Inquiries: If you have any questions regarding the game or its application, please feel free to contact us at: Send E-mail to: econgame. National flags represent each country and depict their economic position in the playing field. Players can choose their country from a selection of more than 60 nations. Original design visually displays goals and economic performance with simple icons. basic principles and institutions and acquire an economics vocabulary. Global Game News reports Current Events which occur randomly during each player's turn. and overall performance of a given economy. Professor N.D. Cator explains how Aggregate Demand and Aggregate Supply interact to determine the level of output, employment, and prices. He also points to the direction of the Economic Indicator during the game. When you play the game against the computer, he is the economic adviser to computer-managed countries. Players use economic policies to manage their economies and get to the center of the playing area. Fiscal policy can effectively combat recession, and fine tuning options are available. However, fiscal options can be impeded by policy gridlock. Trade policy affects other countries. Currencies can be deliberately depreciated or appreciated. Free Trade Areas can be formed by mutual agreement. Monetary policy is flexible, but it has a time lag. Price controls are available, but they can backfire! Laissez Faire Countries: These countries are programmed to move toward the center of the playing area most of the time. They represent the neo-classical theory that market economies automatically adjust to an economic imbalance. They can be very competitive opponents and are quite capable of winning the game! The final score at the end of the game can be printed to hard copy, indicating the date and time. 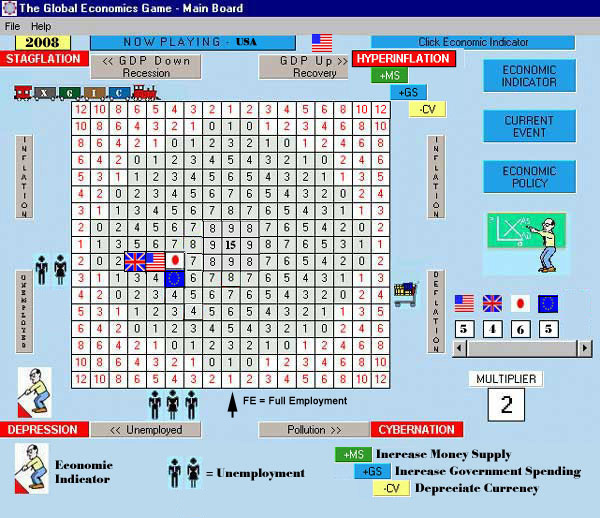 The Global Economics Game is easy to learn for the first time by selecting tutorial from the CD's main menu. Each new game is exciting and fun to play. You can match wits against other players or against up to six computer managed or laissez faire countries. Winning requires concentration, prudent policy management, and some degree of good luck. Win or Lose, you will enjoy playing the game! Questions and Inquiries: If you have any questions about how the game is played or its applications, please feel free to contact us at: Send E-mail to: econgame.